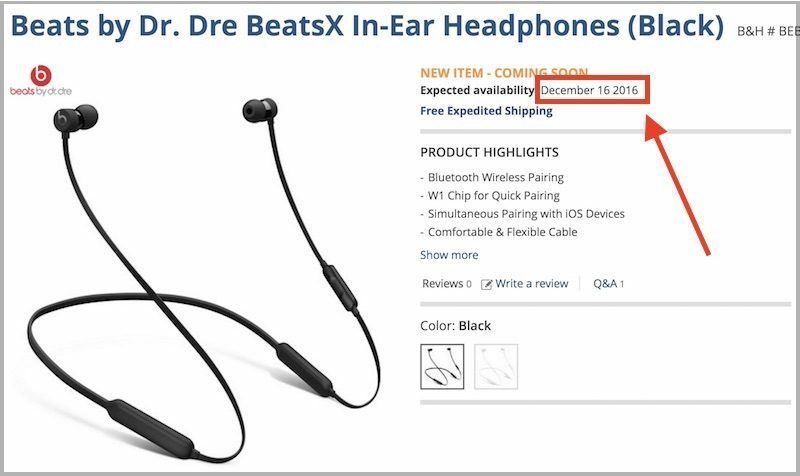 Similar to the current confusion regarding the release date of Apple's AirPods, a couple of differing launch days for the new wireless BeatsX earphones have begun sprouting up online, leading to uncertainty over when exactly Apple will begin selling the new Beats-branded earphones. In line with some AirPods rumors, most retailers are placing order dates in December for BeatsX. The new rumors would mean BeatsX will miss the retail rush of Black Friday and Cyber Monday coming up this week, but would place the earphones as potentially available for last-minute holiday shopping later in December. Fry's Electronics has the earphones listed as estimated to ship on December 5, 2016. Users can add the BeatsX to their cart, but pre-orders aren't available yet as checkout can't be completed at the time of writing. The date was originally spotted by a user on Reddit. Photo, video, and audio electronics retailer B&H also has a date listed for BeatsX, with expected availability of the earphones on December 16. Users can pre-order BeatsX at B&H, although detailed shipping estimates for them are not yet available. 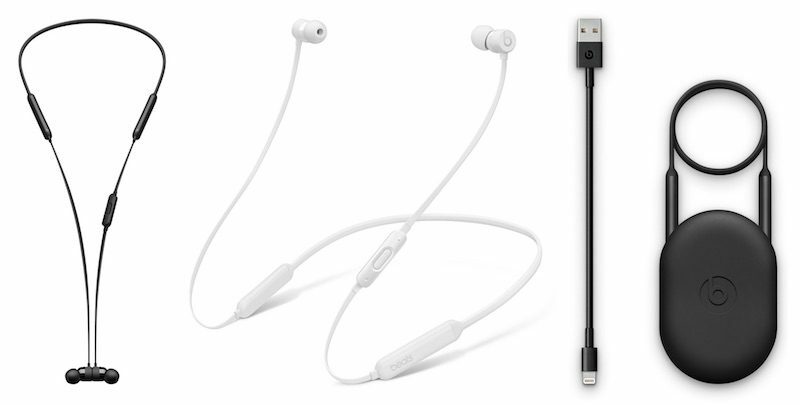 At both Fry's and B&H, the BeatsX earphones are listed at the expected price of $149.95. On Apple's website, the earphones are still simply "coming this fall." As was the case with the AirPods, it's likely that most retailers are using placeholder dates for BeatsX until they receive word on the official launch. Still, since November is nearly over and there's been no word from Apple yet, there is a growing possibility that both AirPods and BeatsX will launch sometime in December, in time for holiday shopping. The BeatsX earphones were announced during Apple's September 7 iPhone event, along with the Beats Solo3 and Powerbeats3 devices. The new line of Beats headphones have Apple's W1 chip -- also found in the AirPods -- that lets them pair easily with an iPhone. The Powerbeats3 wireless earphones launched in October. 1. The design doesn't look dorky, plus they're magnetic, so when you take them out they just fall and snap with eachother and hang in front of you. Also they include a volume/skip control. 2. They charge via lightning cable, so that's one less cable to keep up with. 3. They're probably gonna sound better than the AirPods (and at a slightly lower price-point). That's just too late for the Christmas season. Order one week before Christmas and probably have 1-2 week shipping date and then have to be at home (versus traveling) to receive them? Total mess. Total miss. Expected release: December 16, 2016. Actual Release: December 17, 2019. Am I the only one who thinks "BEATSEX" is a terrible name for this product? What was the delay on these? It is the new Apple, where every product is now delayed a minimum of two weeks up to indefinitely. Bose SoundSport Wireless are going to still be much higher quality than these. Don't waste your money on Beats. Not helmet-compatible. Shorter battery life. Different charging cable. No W1. Bose might be better for some users, but I won't be one of them. its beats x. I think you are just reaching too hard for that one. I would at least wait until some reviews come out. If you're in the apple ecosystem the W1 is a must have for wireless headphones. Should be the other way around. Another myth.Let's assume for discussion sake that it falsl out of your ear, (which according to all of the testers is hard to do, but it could happen). When you are listening to music or something and somehow one of these bright white object objects falls out of your ears and falls to the ground how hard would it be for you to bend down and pick it up off the ground since it is going to fall at your feet??? Under what reasonable scenario would it be difficult to find this bright white object laying by your feet? Riding a bike. Riding a motorcycle (although, I suppose you should have a helmet on). Jogging/running on a trail with tall grass/rocks. Getting jostled on a busy subway/metro/train/bus with no room to bend over and search the ground.